In the last several weeks we have seen a definite increase in consumers questioning whether they should refinance their mortgage. With interest rates remaining low and changes in mortgage insurance premiums announced by FHA in January, many borrowers are wondering if now is the time to refinance. Reduce the rate and lower the monthly payment. Reduce the term of the mortgage (number of years). Remove or reduce mortgage insurance from the monthly payment. Remove a party from the existing mortgage. Take cash out of the equity to do home improvements. Purchase investment property or a second home. 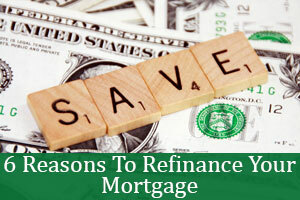 Each of these may be a good reason for refinancing. Once we know the goal, the next step is to determine whether it really makes sense for the borrower to proceed. A reduction in rate can save significant amounts of money in interest over the life of the loan. A borrower that has a $200,000 loan at 6% can save up to $65,000 over the life of the loan if they are able to refinance at 4.5%. However, for others the savings from a refinance may not outweigh the costs, depending upon the loan size, existing rate and how long you plan to be in the home. On small loans, even an interest rate reduction of 1% may not yield savings to justify the costs incurred. The borrower should also consider the effect of increasing the remaining term of the loan. If you started with a 30 year loan 6 years ago, is it worthwhile to go with a new 30 year loan. Many people whose primary goal is to reduce the payment are comfortable with that strategy and in many cases there will still be significant savings over the life of the loan. Other borrowers, who don’t want to increase the term back to where they started, may wish to consider a reduction of the term as well as the rate. It may be possible for you to not only decrease the rate, but also decrease the term while reducing the payment. There are some lenders that will allow flexible terms, not just the usual 15, 20, 25 or 30 years. We have programs that allow the borrower to choose their term – whether it is 18, 23, 28, or any number of years they may choose. We can then determine, based on the rate and your payment goal, which term works best for you. One of the biggest questions we are seeing right now relates to removing or reducing mortgage insurance. Many people are hearing about FHA mortgage insurance premium reductions. Depending upon the year you took out your FHA mortgage, it may very well be worth looking into refinancing. If you obtained your mortgage when FHA premiums were 1.35% in recent years, a reduction to .85% may save you a lot of money each month. In addition, many of the FHA files we have looked at lately also have experienced increases in the value of the home. In some cases, the values have increased to the point where the borrower has enough equity to convert their loan to a conventional loan and even further reduce or eliminate their mortgage insurance premiums. We evaluate each of these options when determining which is the best approach. The FHA program also offers a Streamline Refinance which may even eliminate the need for an appraisal and reduce documentation needed to qualify. For more information, see: 3 Types of FHA Streamline Refinances To Lower Your Monthly Mortgage Payment. Removing another party from the loan is also a good reason to refinance. We see this often in divorce situations. Many people do not realize that even though a divorce decree stipulates that one party may receive the home and be responsible for the mortgage, it does not remove their obligation of repayment in the eyes of the lender, even when there is a transfer of title. The only way to remove that party from the mortgage is to refinance. Otherwise this mortgage stays on the credit report of both parties. Nonpayment by the party retaining the home in the divorce can severely impact the credit of the other party. Over the last few years, many people in a divorce situation were unable to refinance due to declining home values, but now may be the time to take another look at this. Another good reason to refinance is to take cash out of your home for home improvements or other needs. Again, home values have been increasing in recent years, which may allow you to refinance – maybe even to a lower rate – and get cash back. For more information, see: Cash-Out Refinancing, Recent Changes, and Evaluating Other Options. Refinancing your mortgage to a lower interest rate, and/or refinancing to remove mortgage insurance, saves a great deal of money over the life of the loan. For example, see this Zillow infographic showing that refinancing to a 1% lower mortgage interest rate saves enough to make a 20% down payment on a $264,000 second home. Cash-Out Refinancing gives borrowers all the money-saving benefits of refinancing, while also allowing them to take cash out from the equity in their home. There are no stipulations on the use of the cash, so many borrowers use the infusion of cash to invest in real estate or purchase a second home. Many people could benefit from refinancing, but they have not taken the steps to save thousands on their mortgage by refinancing their home. There can be many reasons for this, but often it is because of the uncertainty of whether it is really worthwhile. Whatever your goals may be, we will help you to evaluate the options and make sure that whatever you do makes the most sense for your particular situation. Please contact us for your free mortgage consultation today!